No First Attack in Karate? In recent years there has been much debate as to the legitimacy of pre-emptive striking. Some support the method stating that action is always faster than reaction, and emphasise the importance of seizing the initiative in high-risk situations. Others object to the method on ethical grounds. Gichin Funakoshi's famous quote, "Karate ni sente nashi" or "There is no first attack in karate" is normally used to justify this stance. As a traditional karateka, it is my belief that training should revolve around self-development & self-defence, and should effectively promote both. We do not wish to produce training grounds for thugs nor do we wish to fail to equip our students to deal with society's violent minority. The issue of pre-emptive striking is certainly controversial (as I found out after I included it in my book 'Karate's Grappling Methods'!) One thing that both camps agree on is that fighting is to be avoided whenever possible, it is what to do when fighting cannot be avoided that causes the debate. There can be very few martial artists who believe that the individual has no right to fight back, the question seems to be at what point is the use of force legitimate? In his book 'Karate-do Kyohan' Gichin Funakoshi wrote, "When there are no avenues of escape or one is caught even before any attempt to escape can be made, then for the first time the use of self-defense techniques should be considered. Even at times like these, do not show any intention of attacking, but first let the attacker become careless. At that time attack him concentrating one's whole strength in one blow to a vital point and in the moment of surprise, escape and seek shelter and help." This is exactly what many of those who teach the pre-emptive strike recommend. It is interesting that the preceding quote states, "…at that time attack him…" as opposed to, "...at that time wait until the assailant attacks before countering…" It would seem that once all other options have been exhausted, Funakoshi had no problem with the pre-emptive strike as a means to facilitate escape. I believe the pre-emptive strike to be a "defensive" method in so much as it is a way to avoid the unprovoked assaults of others. Striking an individual when they did not initiate the assault would undoubtedly be a violation of karate-do ni sente nashi, however, I feel that being pre-emptive, when one is convinced that the aggression of others can in no way be avoided, is ethically just. Another reason that acting pre-emptivly is often scorned is the fact that all the kata begin with a defensive technique. Much has been written about how this underlines the importance of not striking first. Indeed all the katas do begin with defensive techniques, some of which are pre-emptive! The opening salutation and movement of Passai (Bassai-Dai) is a good example (see page 112 of the KGM book). The opponent has merely acted in an aggressive fashion (shaking their fist) and the kata regards this as justification enough for action to be taken. There are many other examples of the katas being pre-emptive (Page 45 & 124 are good examples). The practice of pre-emptive striking can be found as part of everyday practice within Wado-ryu (whether it is recognised as such is a different matter). On the Wado-ryu syllabus we can find 'Tobo-Komi-Tsuki' which is a head punch that is delivered from natural stance before assuming a fighting posture. The technique has no preceding block and would appear to be contrary to 'karate-do ni sente nashi' if the prevailing interpretation of 'there is no first attack in karate' were correct. 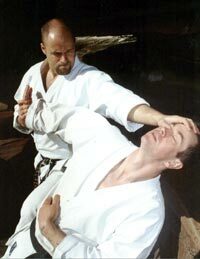 I believe that Otsuka meant for this technique to be used as an assailant was preparing to launch an unprovoked attack and by including it in his style acknowledged the importance of practising such methods. Otsuka - like Funakoshi - also emphasises pacifism and the importance of avoiding conflict wherever possible, and in no way advocates striking an individual whom is not preparing to launch an attack. In his book 'Wado-Ryu Karate' Otsuka wrote, "There is nothing as unfortunate as finding one's self in a situation where he must utilise martial arts to protect himself. The objective of martial arts training is to train hard and yet search for a state where martial arts need not be used. Hence, one must seek the path of peace and desire that path as well." Acting pre-emptivly has always been a part of Budo. In the classic text on strategy 'Go Rin No Sho' or 'The book of the five rings' Miyamoto Musashi tells us of three methods to forestall the enemy, one of which is, 'attacking on the enemy's preparation to attack.' This is exactly what we are doing when we deliver a pre-emptive strike. If we attacked when the enemy was not preparing to attack, then we are acting in a manner inconsistent with the ethics of the martial arts. If, however, the opponent is preparing to attack then we are simply gaining the initiative and ensuring our safety. Once the initial strike has been delivered we should seize the opportunity to flee. If we continued to strike the opponent we would be morally (and legally) in the wrong as well as putting ourselves at risk should the opponent have accomplices that we were not previously aware of. The pre-emptive strike should not be used to settle arguments or as a means to weaken an individual to enable us to give them "a good kicking." What we are taking about is the legitimate use of a pre-emptive strike, when no other options are available, to distract the assailant in the instance of unprovoked attack in order to facilitate escape. If the pre-emptive strike is used in this way than I believe it is in no way contrary to 'karate-do ni sente nashi' (and - judging by the quote from Karate-do Kyohan - neither did Gichin Funakoshi). Should we not gain the initiative, and the chance to escape that it provides, we will be forced to fight (it we are still able) and that could result in far greater violence being committed either to our opponent or ourselves. As true martial artists we should always desire to cause as little damage to our opponent as is necessary to ensure our safety. If we do not act pre-emptivly, we will be forced into a position of having to do ensure the opponent cannot function, as opposed to mealy being sufficiently stunned to ensure effective escape. Another vital consideration is the strong possibility of multiple opponents. If we do not seize the initiative in this situation we are putting ourselves at great risk. When setting the standard of 'karate-do ni sente nashi' I do not believe that it was the intention of the masters to ask us to act in a manner that would give societies violent minority the advantage, but to ensure that we do not become part of that minority. Some would say that by striking first we are 'lowering ourselves to their level.' I strongly disagree with this statement as when a true martial artist is forced into the position of having to use a pre-emptive strike it will be with a sense of regret. They will have done everything possible to avoid and defuse the situation and now must use force if their safety is to be assured. Compare this with the assailant who is using force for personal enjoyment or financial gain, who will feel good about the infliction of pain, and far from avoiding violence, has actively sought it out!